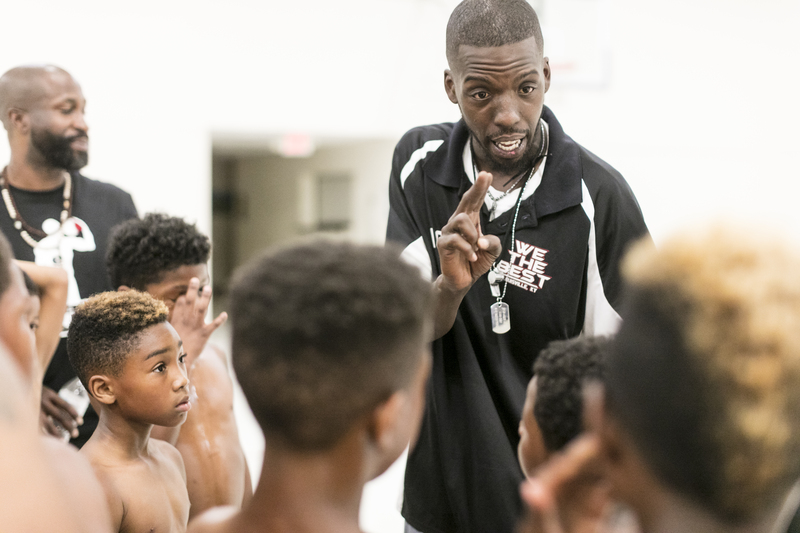 LOUISVILLE, Kentucky — The boys sweating and gasping for breath in this community center gym are AAU state basketball champions and will leave soon for Orlando, Florida, and a shot at the national title. Coach Patrick McGee reminds them to pack toothbrushes and deodorant. The team, accurately if immodestly called We The Best, has just finished running a seemingly endless round of full-court sprints because of some missed free throws. But McGee has no patience for their tears or exhaustion. Patrick McGee talks to his team as they prepare for their upcoming national tournament. These kids look exhausted and undersized, but they play an aggressive, up-and-down style that’s hard for players this young to execute as consistently as they do. After an impressive romp through the Kentucky state AAU tournament for 9-year-olds in March, one in which their coach says the team crushed their six opponents by about 20 points a game, We The Best will begin play in Orlando on Sunday. The trip, which will be the first time in Florida for many of the boys and their families, comes as a much-needed distraction from historic rates of violence in their hometown. In Jefferson County, which includes Louisville, there were 123 homicides in 2016, breaking the previous high set 45 years earlier. It’s a city in crisis that’s largely been overshadowed. One of the most telling examples of this was when it was left out of President Donald Trump administration’s new federal program to help reduce violent crimes in a dozen cities — some that had homicide totals that are dwarfed by Louisville’s. And the violence isn’t slowing down. From the start of the year through June 29, 66 homicides have been investigated by the Louisville Metro Police Department, 20 percent more than the same six-month period last year, according to the department’s Homicide Unit. “There’s a lot of bad stuff out there, but you try not to think about it,” said point guard Brandon Heath, who lives in the city’s West End, where a large portion of the violence and gang activity unfolds. 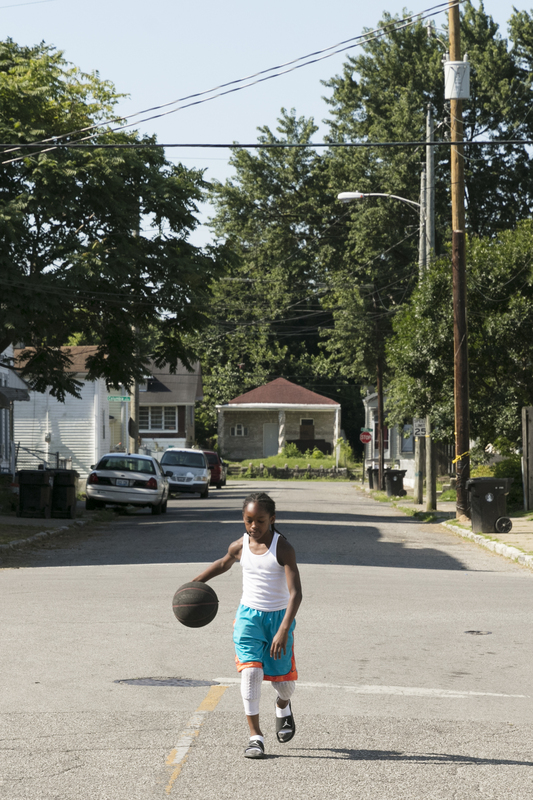 Jermaine “Chief” Cameron Jr shoots hoops on the street outside his home in the Portland Neighborhood of Louisville. Gun violence has become an issue in this community and murders in Louisville are already outpacing 2016. But there’s another reason the rise in homicides isn’t lost on this group of rising fourth-graders. 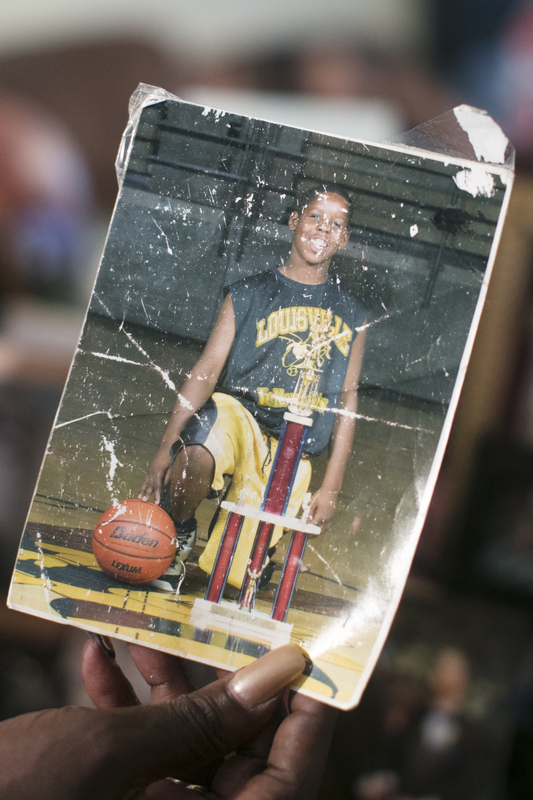 Three weeks after they won their state title, McGee’s brother, Lee, a star high school basketball player in Louisville during the mid-2000s, was gunned down outside of a convenience store in the West End. Since then, the team and their families have rallied around their coach in his time of need. 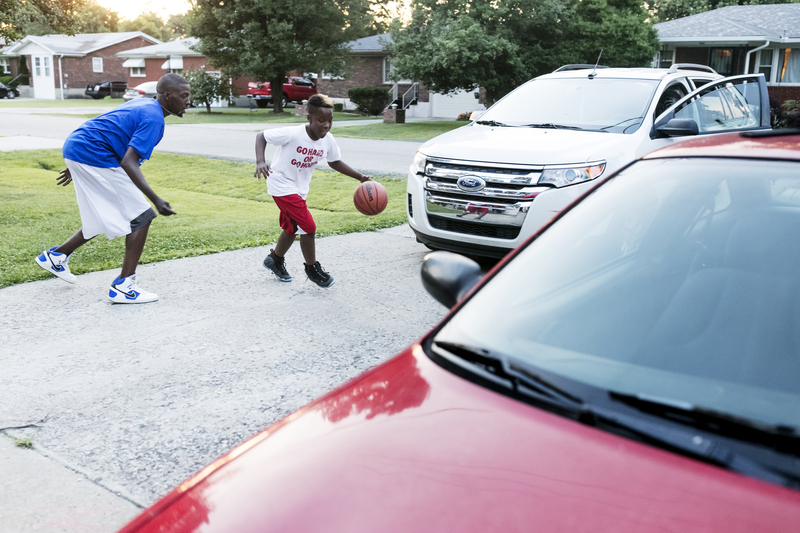 Playing for a national title and getting a trip to Orlando is cool, but keeping the days busy in an area that’s going through a significant uptick in violence is just as important for the families — and the man who leads them. Patrick McGee holds up a photograph of his brother, Lee Andrew McGee, who was killed in a shooting in March. Patrick McGee and his mother, Aretha McGee, walk toward a corner of the expanding cemetery. The grave, still awaiting both grass and a headstone, is marked by an empty bottle of Remy Martin cognac buried in the dirt. Lee McGee won’t be alone here: No more than 75 feet to the right of where he’s buried are similarly bare plots for two of his friends who were both killed recently. Mother and son exit Patrick McGee’s black Chrysler 300, which has newspaper obituaries of family and friends covering the dashboard. “I lose friends around here on a daily basis,” he says. 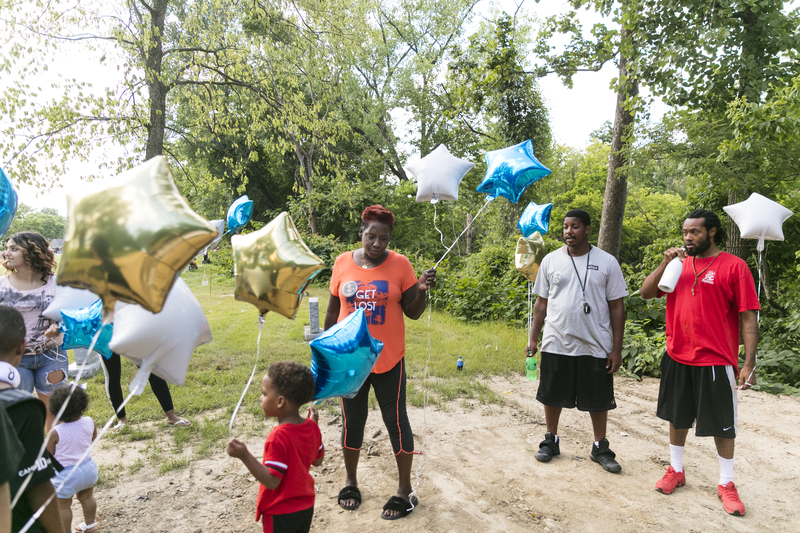 Surrounded by friends and family, Aretha McGee Bond holds balloons before releasing them at the grave of her son Lee Andrew McGee. It’s been three months and a day since Lee McGee — a 26-year-old brother, son and father of two — was killed, but the passing time is not making these visits any easier. Aretha McGee, wearing a pin with a picture of her deceased son, picks up a stick and writes his name where the headstone will go. As the wind blows through the trees, Aretha McGee tells me that it always comes in like that when they arrive; it comforts her. Patrick McGee bends over the Remy Martin bottle and quietly talks to Lee. “Miss you, baby,” he whispers. Aretha McGee Bond hold a picture of her son Lee Andrew McGee. Basketball was the boys’ lifeline amid the chaos. It was in their blood. Aretha McGee played for her high school team, and their uncle, Lee Lampley, was a schoolboy legend in the early ’90s and an all-state selection in 1994 who rode a silky-smooth jumper to average nearly 30 points a game that year for Rockford’s Boylan Catholic High School. Lampley’s low grades kept him from getting a look from a major school, and he was later kicked off two junior college teams. If not for a series of felonies, Sports Illustrated wrote in 2015, Lampley could have been one of the best shooters of all time. Though family and friends laud Patrick McGee for coaching and his own play — he stuffs the stat sheet as a 6-foot-4 guard for the Kentucky Flash of the semiprofessional Midwest Basketball League — it was his younger brother who was dubbed “Lee-Bron” by those who saw him play at Central High School, Muhammad Ali’s alma mater, where he averaged 18.9 points per game as a sophomore. But, much like his uncle, that greatness didn’t last. Sorting out some disciplinary issues, Lee McGee graduated from a different high school and stopped playing organized ball altogether. But Lee McGee felt connected to the next player in the family’s basketball bloodline: Patrick McGee’s son Da’shawn, one of the players on We The Best. He attended a lot of Da’shawn’s games, regularly played his nephew in games of one-on-one and celebrated with team members as they won the state AAU tournament. After a day filled with basketball camp and football practice, Patrick McGee plays a game of one-on-one with his son Da’shawn. “He always said if I could get 20 points, that he would give me $20,” Da’shawn recalled, proudly stating that he won that bet three times. People talked about what could have been for Lee McGee on the basketball court right up until the early morning hours of March 28. At 1:13 a.m., Lee McGee left Club Legends, a local nightclub, with some friends. He wanted to take his girlfriend and others out for margaritas, Patrick McGee said, but first decided to stop at Dino’s Food Mart, a block from the club. As Lee McGee walked toward the entrance to Dino’s, Charlie Shoulders, 24, allegedly pulled a gun from under his hoodie and shot him three times in the chest. Shoulders was free on bond for drug and firearms charges from 2016, and police believe the two had recently gone back and forth over a woman. In security video footage, Lee McGee is seen trying to shield his head and face. He was rushed to an emergency room at the University of Louisville Hospital. 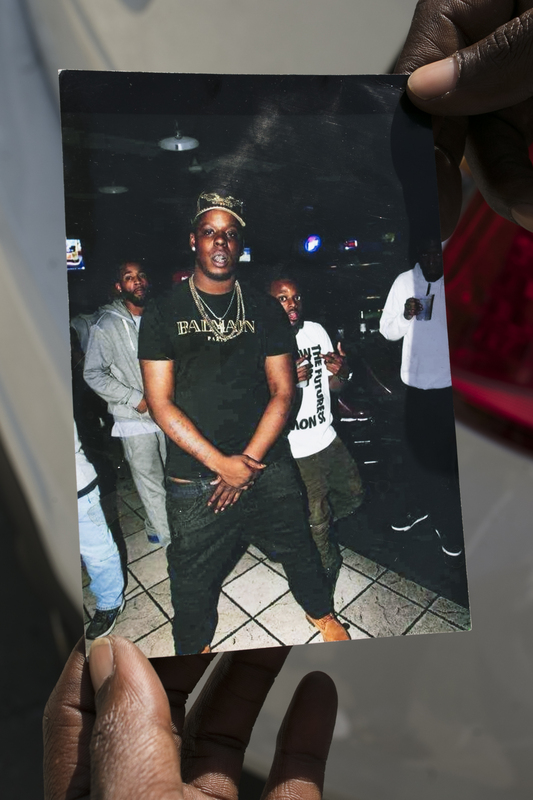 “It was just an overt, brazen act by his perpetrator,” said Louisville police Lt. Emily McKinley, who oversees the Homicide Unit and has responded to at least 400 homicides since 2011. “I think that resonated with everybody. He clearly wanted something to happen to Mr. McGee.” Shoulders was arrested two weeks after the shooting and indicted for murder by a grand jury in April. Patrick McGee stands in front of Dino’s Food Mart, where his brother, Lee Andrew McGee, was killed in a shooting in March. Asleep at home that night, Patrick McGee was awakened by someone beating at the door. His phone was out of commission, and the woman at the door, a family friend, handed him hers. On the line was Erica Dotson, the mother of his two children, who told Patrick McGee that his brother had been shot. He dropped the phone and went to pick up his mother, doing 100 mph on I-65 toward the hospital. When they arrived, he estimated there were more than 200 people outside waiting to learn of his brother’s fate. Aretha McGee has relived that night every day since then. On the three-month anniversary of the shooting, Patrick McGee took me to the spot where his brother died. It’s only the second time he’s been there since March 28. He notices that a makeshift memorial of flowers and photos for his brother outside Dino’s is no longer there. People filling up their cars at the gas station next door and shirtless customers walking in and out of Dino’s shoot glances at us, wondering what we’re doing there. We leave less than a minute later. Patrick McGee doesn’t look back. Inside the Lighthouse Community Center in nearby Newburg, it’s all about family during practice. Sure, Patrick McGee and his assistants will get on the boys for sloppy defense or poor free-throw shooting. But since Patrick McGee has coached most of them since they were 5, these critiques come from a place of love and familiarity. “He’s cool, but sometimes he makes us run and do 20 push-ups,” center Keriawn Berry said with a grin. 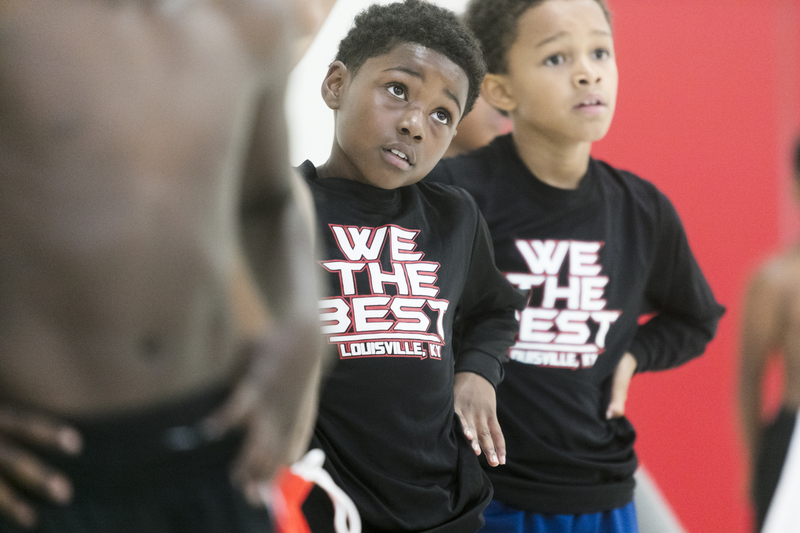 Members of the We The Best Basketball Team practice for their upcoming national tournament at a gym in Louisville, Ky.
Parents and guardians stay through practice from beginning to end, with toddlers and other children running and playing on the sidelines. They say the team has come a long way since it started practicing in a small gym in one of the area’s most troubled neighborhoods. Sitting in the stands and patrolling the sidelines, the parents are candid about why they keep their children’s days full of sports and other activities. The West End is filled with boarded-up homes, rundown businesses and vacant lots. Though Louisville won a $30 million federal grant for the redevelopment of a public housing site, residents say more is needed to fight the drugs and violence that have the city in a vise grip. 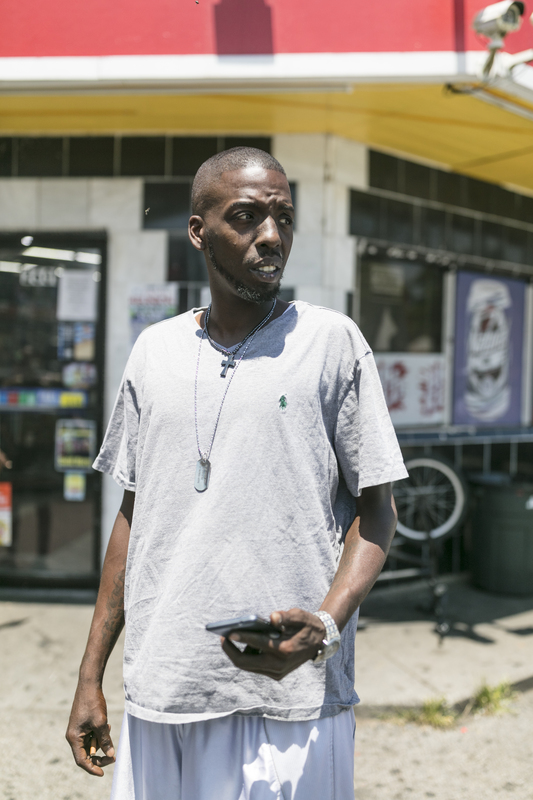 As in many of Louisville’s regional brethren, heroin remains the main drug game in town, both for the addicts and the 25 active gangs that help traffic the product. Although the 150 nonfatal shootings through June 28 represent a dip compared with this point last year, the increased homicide rate means the incidents are becoming deadlier. Whether it’s a morning at Rajon Rondo’s youth basketball camp (Rondo was born in Louisville and played three years of high school ball here) or an evening at football practice, the days are packed so that the boys can go from one thing to the next without having to think about the violence, or see the yellow police tape, happening around them. 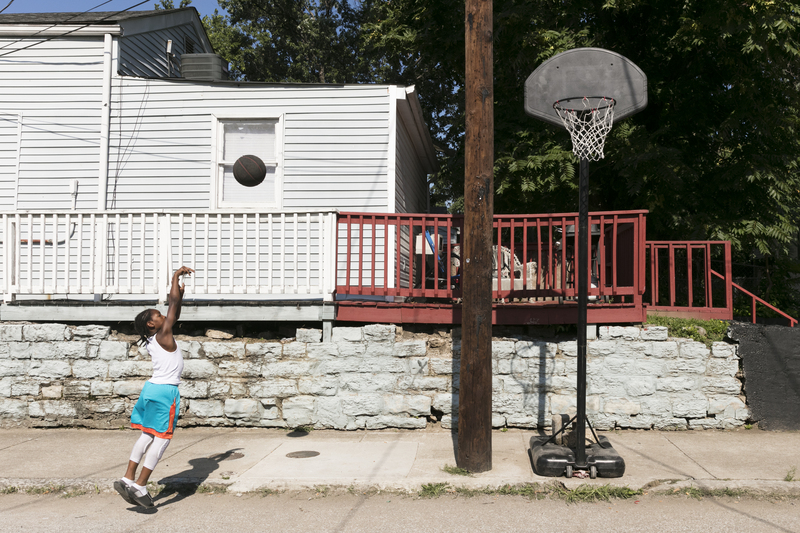 Jermaine “Chief” Cameron Jr shoots hoops on the street outside his home in the Portland Neighborhood of Louisville. It’s a sentiment echoed by Toni Wilcox, the mother of another We the Best player, Marlon Harbin III. The week of Lee McGee’s death, the assistant coaches and parents didn’t plan to see Patrick McGee for the team’s Thursday practice. Yet he was there for the 6 p.m. start. He needed the players for support as much as they needed him for his coaching and leadership. The message? Play as hard as they could and for the love of each other. From there, the team got to running. Last week, about 30 minutes before the start of practice, Patrick McGee and a group of 14 family and friends, including three toddlers, carry 26 blue, white and gold balloons toward where Lee McGee is buried. It’s 16 days before what would have been his 27th birthday. Sipping on a couple of bottles of Luc Belaire Luxe champagne, his brother’s favorite, Patrick McGee and a couple of others pour some out on his plot. On the count of three, they release the balloons, staring at them as they drift into the blue Kentucky sky. “Love you, Lee Andrew,” his mother says. 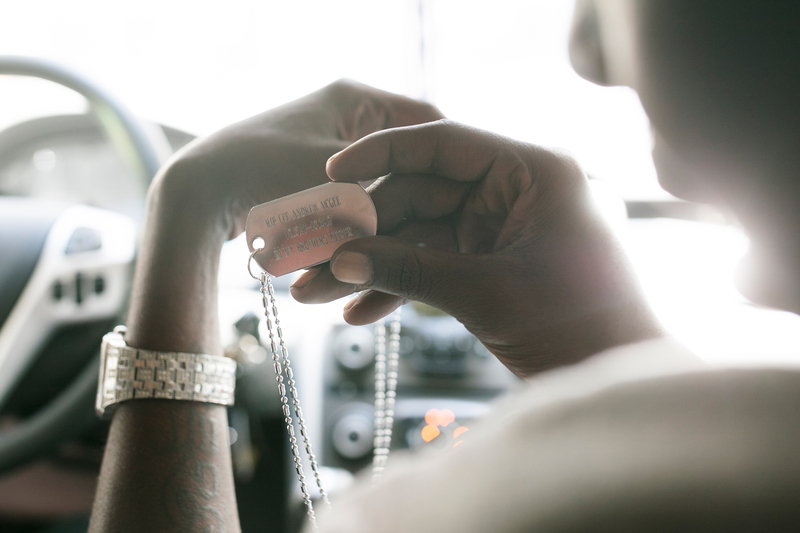 Patrick McGee shows a dog tag he had made to remember his brother, Lee Andrew McGee, who was killed in a shooting in March. Patrick McGee pours out some more champagne before saying his goodbyes. Now, it’s time to make the 15-minute drive to the gym. Nationals are almost here. The team needs its coach. And the coach needs his team.